It is personal contract, i.e. students with teacher makes contract. Such method sometimes is used in Lithuanian schools. But with some exceptions. Teacher acts there as an assistant, inspector of students achievements (i.e. if student achieved planned goals). Technologically- Brigitte is creating e-portfolio. But the questions are: how does she create? How teacher does inspect all this? How teachers do manages? Maybe in Moodle, Wiki or somewhere else? In case we are using e-diary (something like learner information profile + Widget (or other “personalization” technology)) in Lithuanian schools, so may be there possibility to join some how e-diary and e-portfolio? In order to avoid additional work for teachers. A project requires a lot of preparation and additional time, if we are planning to implement this project to whole school community. But this project could be used for the special needs or gifted and talented students. May be this project could be used in classifying pupils by knowledge or by other classification scales. For classifying various on-line tests could be used. Scenarios for pupils could be prepared (offered) depending on the test results. It is time consuming for teachers (if this scenario will be used for all students he/she teaches). We must have strong motivation in order to explain this scenario for other teachers. Because other teachers can ask us why do they need this big and time consuming work? How we will motivate other teachers? This scenario can be used for primary school pupils. Teachers are working there only with one group of pupils. Or this scenario can be used only with small group of basic school pupils (but not with all basic school / class pupils). Self – study, personalization, friendly and easily understandable user environment, empower to individualize student’s homework … There are the main requirements from teachers in order to use this scenario for primary school students. Teachers would like to find everything they need for their lessons in one place; there could be various discussion groups (e.g. forum) + resources (LO) repositories. Lithuanian teachers encounters problem in this scenario – outside experts. This scenario is with outside experts (scientists, businessman,..), but it is really difficult to find and to attract them. So may be we can try to implement this scenario without outside experts… In Lithuania we don’t have such networks of outside experts (e.g. scientists). We do not encounter pedagogical problems, if we will talk only about networks of teachers (colleagues). It would be nice to know more about foreign countries on how they are attracting scientists to such networks. Another problem – not all Lithuanian teachers wants to collaborate and share experience. This is due to high competition among the teachers. At the beginning there could be small group of teachers. May be we can create groups of teachers-experts (not outside experts). We need to encourage Lithuanian teacher to share their experience, to discuss, to collaborate. We are not encountering technological problems. 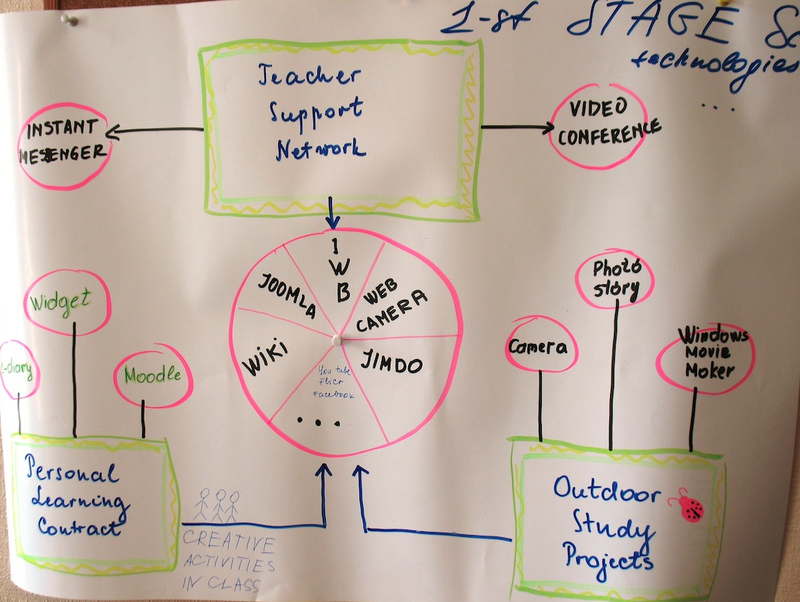 We can use Moodle, various discussion groups (chats, messengers), collaboration groups, Wiki, LO repositories and so on. But there must be easy acceptable technologies for teachers. Conception of this scenario is very interesting, but in case it is compulsory to have outside experts in network, so such scenario could not be implemented in Lithuania (as we do not have outside experts networks in Lithuania). Students work a lot. All students work together. Nice technological decision. Films made by pupils could be seen by everybody (parents, other pupils and teachers). It can be used not only in biology, but in various subjects, so we can rename it as exploratory work. Teachers told about similar project they worked. Students like such projects. In this scenario everything is clear and enjoyable, and it could be developed eagerly. Teachers’ told that they need more technologies (video cameras, Smartboards, iPad, and software for films, websites, etc.) for such scenarios. Not all Lithuanian school are quite well equipped with ICT. Lithuanian teachers’ have implemented similar project in 2003. It was quite successful project. But teachers there played students’ roles.